Kudos to the folks with their pint-sized umbrellas pulled from back pockets, packs and purses. An urban umbrella should be a small quaint affair. Like an umbrella plucked from a Tiki Lounge Mai Tai. What a glorious feeling to move among pedestrians whose umbrellas lift and dip to allow a crowd to go a-swinging through the rain. But I regret, not everyone can splash with panache. So for the rest of you lot, unless you’re caddying for Tiger Woods, leave your double high/double wide sports utility umbrellas at the club. Golf umbrellas in the city! 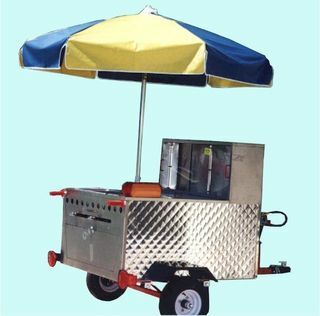 Alpha umbrella is reserved for the hot dog vendor. So unless you’re planning to sell Sabrett frankfurter’s and kraut that are soggier than an August downpour, retire your vanity brolly. Fine, go bigger than Sabrett, commandeer a halal cart and start shaving gyro off a greasy stake. But hang on a minute; you probably already have a job. Which is why your black behemoth is jamming up the subway exit and pedestrian thoroughfare during rush hour. I’m pretty sure there’s a pill you can take for that. They got pills for every other personality problem. Rain won’t change us into some horrible slime that needs a fishbowl and a packet of magic to survive. Trust me, there’s someone on a corner near you selling a small black umbrella for five bucks.